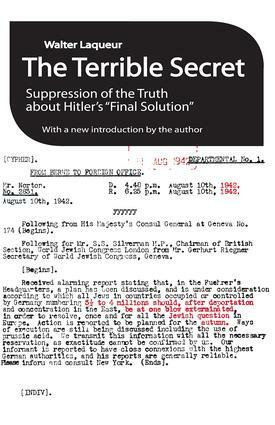 Suppression of the Truth About Hitler's "Final Solution"
This book seeks to answer three vital questions about the worldwide response to Hitler's "Final Solution": When did information about the genocide first become known to Jews and non-Jews? Through what channels was this information transmitted? What was the reaction of those who received word of the slaughter? Walter Laqueur's quest focuses on the period between June 1941, when Germany invaded the Soviet Union, and December 1942, by which time the United Nations had confirmed the news about the mass killings in a common declaration. By the end of 1942, Chelmno, Belzec, Auschwitz, Maidanek, Sobibor, and Treblinka were fully operational and two and a half million Jews had already been killed. According to Laqueur, word started to spread soon after extermination began. But there is no easy, straightforward answer to the wider question of why there was a failure to read and correctly interpret the signs in 1941; why so many individuals and governments actually chose to deny the reality of genocide when faced with incontrovertible evidence. A probing and disturbing work, The Terrible Secret explores one of the most perplexing aspects of the Holocaust, a political and psychological riddle of general significance to the understanding of the history of our times. Germany: A Wall of Silence?